It has been so busy here that there is now a daily assembly line of Vietnamese coffee filters between the rice and Jura Capresso. Smell industrious heaven here now...dripping and dripping. AHH! All the mamas must keep wired and awake! Peewees stragetizing over sorbets...I love our evenings. I'll get some more food stuff up this week. Promise. 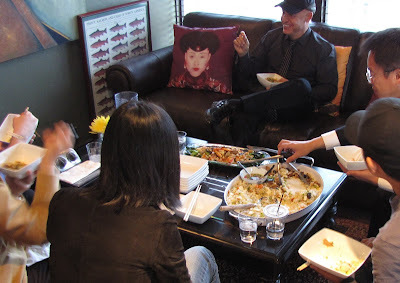 My favorite meal-to-make is the sorta-spontaneous, unfussible Teatime Nibbles, served 3pm-ish in the "time-out room" (aka, den or "cigar room"). This brilliant block of time is neither lunch nor dinner, so visitors arrive comfortable (from lunch, i.e., not starving, ergo, not expecting any food). No expectation = No anxiety and a big PHEW. People usually expect coffee, tea or some sugary drink. And for sassy ones, we have beer, wine and cocktails too - still got another half day to get through now! For this particular group, Chinese reporters and state reps, I immediately think Big-Tray-of-Something...like, a tray piled with awesome Fried Rice, Mix Mushrooms and Chinese Broccoli. Let's do some flash fried King Crab (VERY nice) in mushrooms, Chinese broccoli and oyster sauce...with, of course, the standard condiment bowls of chili and fish sauce. Beverages will be RO water and ice COLD Vietnamese Coffee. Okay, this month we are gonna eat rice with EVERYTHING and we're gonna eat it all day long! Why?! Because I just came home with 50 pounds of aromatic new crop jasmine Buddha rice, the absolute BEST! Warning alert: There are no real measurements this time - SORRY again. I was rushing, lost in the moment, blinded by hoodless cloud of smoke at the Viking. Excused, excuses. Even though I seem unreliable (flaky), I did take pictures! I thought I could easily give some exacts and the pics would jog my memory, BUT, converting handfuls-of-this-much and almost-a-coffee-cup-of-this-much into tablespoons and teaspoons is terribly confusing. The risk of ruining new crop fried rice and king crab because of my bad recipe is too much to bear and I could just DIE. This time, see if the pictures make sense and next time I promise to write down EVERYTHING. (1) First, cut up all those Baby Carrots. Purely a visual appeal - bright little confetti circles, beautiful perfect tiny rounds. Heat a pan generously coated with Olive Oil on High. Cook Carrots on High until some edges turn golden brown. Then add Salt & Pepper and throw in fresh minced Garlic. (3) Cook the Eggwhites in Olive Oil, carefully keeping the whites soft but cooked through (no hard fried crispy brown edges!). Keep heat on medium to low. Eggwhites should be thin, WHITE and crepe-like. About 4-5 batches should cook all of it. Chop into small bite-size pieces, but not too small. Set aside. (4) In another pan in Olive Oil, cook Chopped Onion on High. Salt and Pepper. Add onions to the cooked Carrots, toss and set aside. (6) Again, in a pan coated in Olive Oil, add cooked fresh hot jasmine Rice. Press the Rice down against the pan with a rice spoon against the heat. Salt and Pepper. On High, let the Rice sit for a few minutes to sear (fry) the rice and turn over to sear the other side. Look for golden texture, crunch! (Mushy rice no good, i.e., Panda Express, ew.) We want elegant chewy slightly crunchy texture. Do you see the flat crunchy golden brownish Rice I turned over with the spatula?! 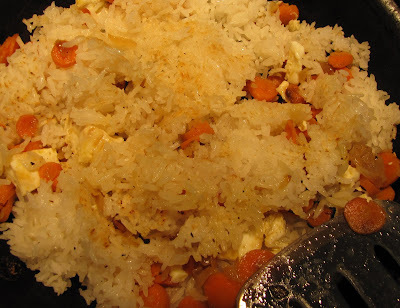 (7) Add the Carrot mixture and Eggwhites to the Rice. Toss evenly. (8) Next, cut up the Asparagus into small slices similar to the carrot effect - little green confetti circles. (9) Add the Asparagus to the rice last to prevent wilt and shrivel-up (from overcooking). By adding them last, they will also stay vibrant green (won't turn a nasty olive muddy green color from being in heat too long). (10) Add chopped Scallion. Toss evenly and add more Salt and Pepper to taste. Add soy sauce if you feel like it. (11) Add Black Sesame Seeds for nutty taste and accent contrasting color. I find by adding just the right amount of Black Sesame Seeds to something so white and colorful makes the dish strikingly attractive. Add enough Salt or soy sauce for additional flavor. We need a substantial item with this gorgeous Fried Rice. Still on a Mushroom kick, we have plenty of Shitake and Empire Mushrooms - awesome, chewy, flavorful with a consistency nearly identical to abalone (or sauteed calamari). People cannot believe how good this is! I always think in terms of color - like, Chinese Broccoli, GREEN, and King Crab meat, ORANGE. LadyK asked me one day, "How do you stir-fry?" Hmmm. I suppose it is the same as "sauteing," but in very High Heat temperature the entire time. The high heat "searing" creates the flavor. Adding water to the food and covering it with a lid, "steaming," ensures that the food gets fully cooked. So the timing and order of ingredients added to the pan or wok are critical to the success of the dish. (1) Beautiful Empire Mushrooms, about 6 inches long and 2-3 inches in diameter. Cut, cook and eat the entire mushroom. Cut the trunks into small bite-size pieces and add to a hot pan overed in Olive Oil. I always keep fresh Ginger root in the fridge. (2) Fresh Ginger Root. Peel, slice, then julienne. Chop the Chili into thin slices. Add the julienne Ginger and Chili to the Mushrooms (still on High Heat). (5) Add some scallions, pepper and a small bit of salt. The Crabmeat is already salty, so easy on the NaCl. (6) Fast steam the Chinese Broccoli by heating Olive Oil in a Pan on High. Add Broccoli. Cover with lid. Then add 1 cup of water and close lid. Let it steam for 5 minutes. Remove cover so the green doesn't turn ugly. (7) Add the Crabmeat to the Mushrooms. Throw in some leftover Corn. (8) Arrange on serving plate. Put the Broccoli down first. Then add the Crab and Mushroom. Serve with some Black Sesame Seeds. Done...delicious! Late dinner, short notice for 2 guys...more Tilapia, Avocado and some Corn! After a FULL day, kids finally in bed and kitchen cleaned, I get a text request at 9pm for 2 plates of dinner ready by 9:15pm (in 15 minutes). Hubby tells me our solo friend hasn't eaten all day and could use some company and a home-cooked meal. OF COURSE. Come on over! I have some fillets of Tilapia left that must be cooked anyway. This time, I want to use corn. I see 3 little fingerlings laying around and the super ripe avocados must be eatened tonight - PERFECT timing. (1) Season the cut avocado, tomato and scallion with salt and pepper. Set aside. 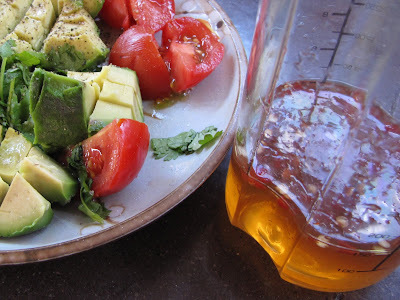 (2) Heat Olive Oil in pan. On high, add onions for 2 minutes, add sliced fingerlings to brown on both sides, add smashed garlic. Add salt and pepper. (4) Toss in Avocado, Tomato and Scallion, arrange in 2 bowls, add black sesame seeds. (5) Add some chili paste and a squeeze of lime. Sweetness, crunch, creamy avocado...with chili kick, very tasty, very good. (1) Turn the Grill on HIGH first. Season the tilapia fillets with Salt, Pepper and Granulated Garlic, Olive Oil. Let marinate room temp. (2) Grill on HIGH (600 degrees) one side for 3 minutes, turn over and grill for another 2-3 minutes. Check for some grillmarks. (3) Have 2 plates of Brown Rice with sesame seeds ready by the time the fish is done. Take the fillets carefully off the grill immediately so that you don't overcook the fish (dry & hard & no good)...deep black grillmarks, soft delicate white center. Perfect. (4) Place the Grilled Tilapia on top of the rice. (5) Add Corn (cold okay). 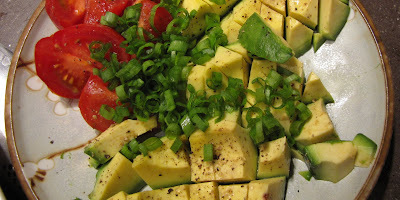 (6) Add/scatter the avocado, tomato and scallion. (7) Add the Vietnamese Lime-Chili Dressing: Pound in mortar 2 garlic cloves and 2T sugar. Add/mix in juice of 2 limes, 1/4C rice vinegar, 1/4C fish sauce, 1/4C water and 1/4tsp chili paste. Pour finished dressing over the fish. Enjoy!